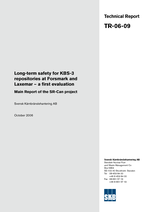 Long-term safety for KBS-3 repositories at Forsmark and Laxemar – a first evaluation, SKB TR-06-09. FEP report for the safety assessment SR-Can, SKB TR-06-20. Initial state report for the safety assessment SR-Can, SKB TR-06-21. “燃料・キャニスタ”プロセス報告書　Fuel and canister process report. 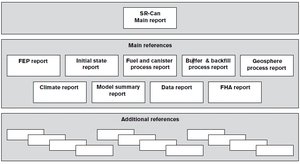 Fuel and canister process report for the safety assessment SR-Can, SKB TR-06-22. “緩衝材・埋め戻し材”プロセス報告書　Buffer and backfill process report. Buffer and backfill process report for the safety assessment SR-Can, SKB TR-06-18. Geosphere process report for the safety assessment SR-Can, SKB TR-06-19. Climate and climate related issues for the safety assessment SR-Can, SKB TR-06-23. Model summary report for the safety assessment SR-Can, SKB TR-06-26. Data report for the safety assessment SR-Can, SKB TR-06-25. Handling of future human actions in the safety assessment SR-Can, SKB TR-06-24.